Previously on cupcakes: apple, and pistachio. Yup, more cupcakes. These are appropriately carrot-y, and I like the walnuts. But there wasn’t enough cardamom – definitely increase that next time, or swap out for cinnamon and nutmeg? Iced with double cream that I’d whipped too much of, for the sponge cake, and blurrily photographed as such below. 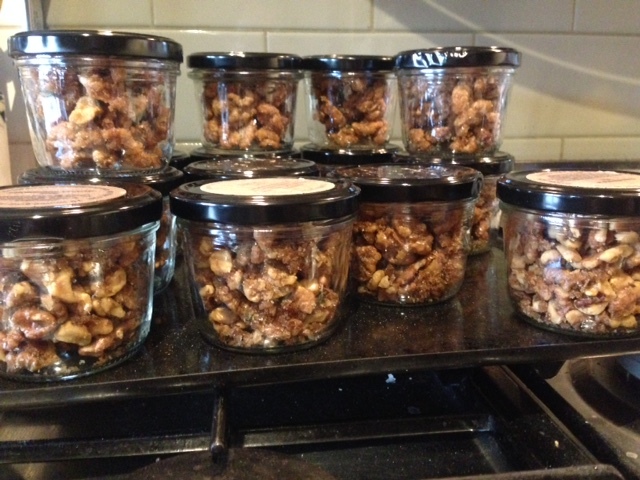 When I moved house a year ago, the amazing Kate of Just Add Moonshine (JAM) sent a jar of candied walnuts. And oh my goodness, they really are like adult candy. Take your walnuts and add a fair bit of sugar, sage that’s been fried in some butter, and salt and roast… and make sure that the other people in your house don’t know where they are. These will just go, because they are just so easy to eat by the handful. I’m giving them away as Christmas presents.